Following the success of Acer's Ferrari laptops, the concept has expanded into a full range of branded systems. With mobility provided by the ultraportable Ferrari 1000, multimedia power is added with the Acer Ferrari 5005WLMi (£1699 inc. VAT). Keeping the look of its predecessors, the Ferrari is partly made of carbon-fibre for strength and style. Plenty of Ferrari branding and red trim throughout the chassis add to the racing image. The scream of an F1 car rings out as the laptop boots up, which should make racing fans smile. To match the high-performance Ferrari reputation, the Acer provides dual-core power. Using AMD's Turion 64 X2 TL-60 processor, 64-bit software compatibility is also in place. A huge 2GB of memory supports the CPU, as does a 160GB hard drive spinning at 5400rpm. Scoring just 209 points from MobileMark 2005 tests, performance failed to meet expectations. However, day-to-day ability remained proficient. To enjoy the full benefits of the AMD chipset, software fully optimised for dual-core and/or 64-bit processes will be necessary. A key selling-point is multimedia power. Using an ATi Mobility Radeon X1600 graphics chip, mainstream gaming is possible. Scoring 7647 points from 3DMark 2003 tests, high-performance 3D games will struggle, but for most multimedia tasks, the Acer will run efficiently. The 15.4-inch screen is excellent. With a Super-TFT coating, images are bright and natural. The high WSXGA resolution of 1680 x 1050 pixels ensures a good degree of clarity, and provides ample room for working with multiple windows. A 1.3-megapixel camera sits above the screen for messaging and conference use. Pre-installed Acer OrbiCam software makes it easy to record video. Another notable addition is the Acer's optical drive. For playing back high-definition video, the drive supports HD-DVD. Supporting CD-RW and dual-layer DVD/-RW disc formats, data can be saved externally with ease. Connectivity is strong for home and mobile use. Gigabit Ethernet provides high-speed fixed networks, while 802.11g Wi-Fi does the same for wireless access. As with many Acer laptops, usability is excellent. The keyboard curves upwards at each end for a more natural typing position. The right side of the chassis tends to get warm quickly, but not enough to hinder laptop use. 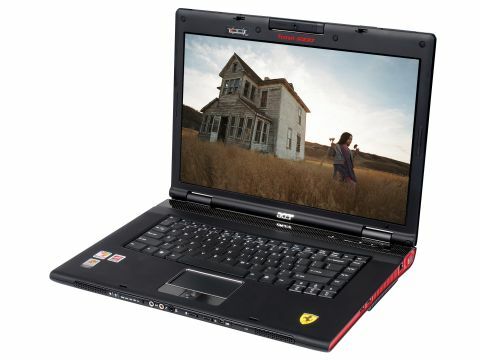 The Acer Ferrari 5005WLMi is an outstanding laptop on many levels. The price and design may deter some, but underneath lays an impressive system with the power to back it up.